I know we look forward to Thanksgiving leftovers as much as the bird and we think The Best Turkey Tetrazzini with Mushrooms and Bacon is one reason why; it’s a family favorite! A very small library; there is this fantastic casserole and a turkey sandwich with cream cheese and cranberry sauce that goes far beyond the convention of just putting everything from the Thanksgiving feast on a bun. While I do love the Maple and Bacon Turkey with Cornbread Stuffing that I posted recently, sometimes I think it’s this leftover that I love even more. 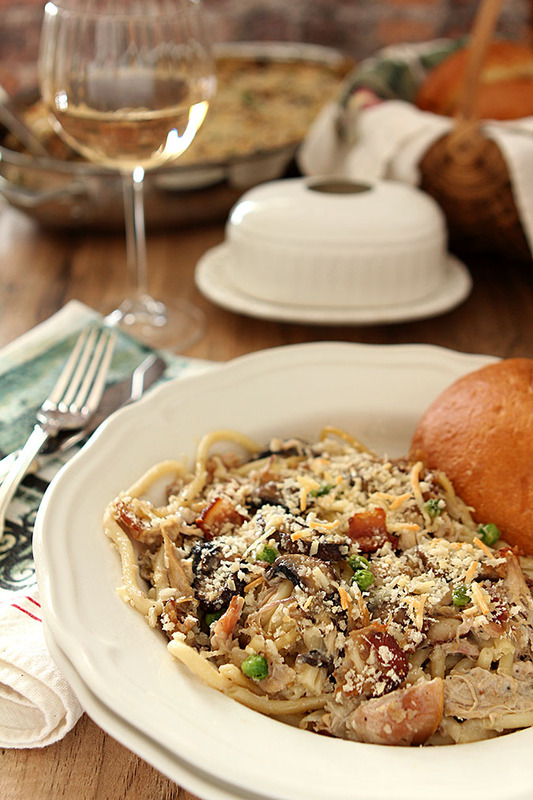 Though with a few more ingredients than that original recipe, we think The Best Turkey Tetrazzini with Mushrooms and Bacon is worth adding the additional ingredients. Originally envisioned as a casserole with a sherry flavored white sauce that combines pasta, poultry, mushrooms and Parmesan cheese I’ve taken to adding more components over the years. The addition of garlic, bacon and herbs? Do I really need a reason for adding them? That’s what I thought…sure boosts the flavor profile of a dish that I’ve had too often and could only describe as bland. Peas? No, they are not essential but they are the one vegetable that I always make for our Thanksgiving Day feast because they are simple and colorful and I’ve usually got some leftovers in the fridge. One year they were added to this dish ‘just because’ and they’ve since earned their place as a regular. This year, in conjunction with this dish, I’m so pleased to announce my new partnership with Swanson as a Brand Ambassador. Ours is the perfect marriage; their product is something that is a mainstay in my kitchen pantry. You might think, as someone who prides herself on all things homemade, that after a feast including turkey which guarantees a big carcass with a fair amount of meat that I might be showing you my secret to making broth. There is no secret; I simply never make it. The truth is that once I go to the trouble of slow cooking the carcass and wings with the trifecta of onions, carrots and celery that I could never just strain that magic potion and save it for stock…I always go full steam ahead and make Turkey and Dumpling Soup. Instead of homemade I use from my ready supply of Swanson Chicken Broth that is always in my pantry (I do shop Costco so you know what I mean by ready supply right?). 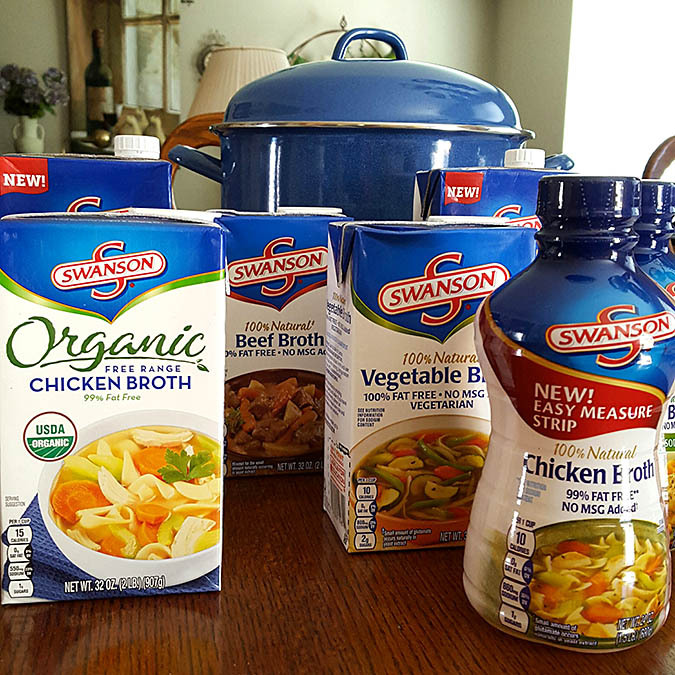 I’m not alone; both chefs and home cooks alike know what a great resource Swanson broth is; you simply cannot beat the convenience or the taste! This month’s theme for my first Swanson post is ‘Give Thanks for Leftovers’ and it provided me with the perfect opportunity to do just that with this recipe for Turkey Tetrazzini. Swanson Certified Organic Chicken Broth is a big component and adds great additional flavor to this turkey dish. 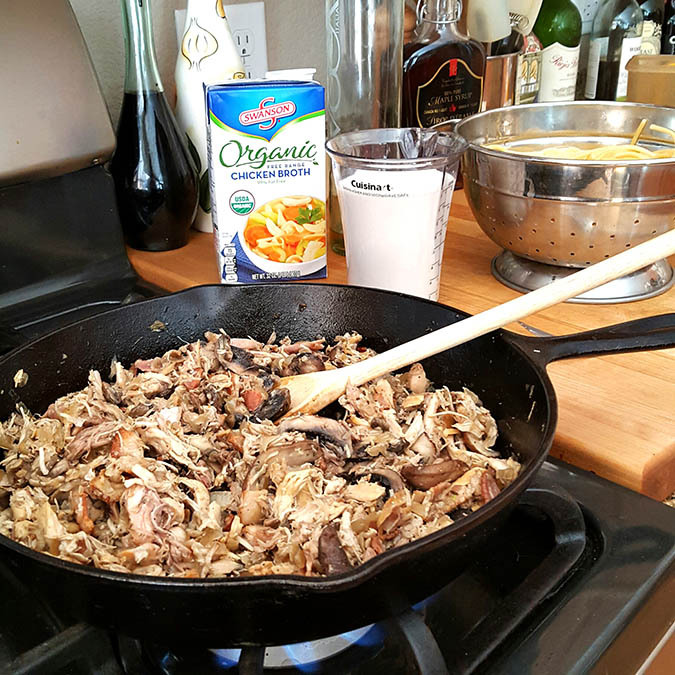 Once the bacon and aromatics are finished cooking and the mushrooms and turkey are added to the mix, the sauce that is added includes half and half, chicken broth, sherry, and Parmesan cheese in a rich and flavorful combination that is sublime. Top it all with a panko bread crumb and Parmesan cheese mixture for crunch and I could eat it every day until it’s gone. Wait…I DID eat it every single day until it was gone! Serving leftovers more than once like we do? One tip I’ll share that I think makes a huge difference. Prior to reheating, even in the microwave, drizzle a bit more Swanson chicken broth on top of the dish. Repeated warmings will dry any dish out and this will insure a rich and creamy result each and every time. I hope everyone has a warm and wonderful Thanksgiving holiday; making this dish after the holiday might just help that glow last even longer. The best reason to have leftover turkey after the holidays; also great with chicken. Cook pasta al dente, drain well; toss w a bit of olive oil if not ready to add to sauce, and set aside. Cook bacon in a large oven-proof casserole dish. When the bacon has rendered most of the fat but is not yet crisp, add the onions and saute for 5-6 minutes or until they start to become translucent; add the garlic and saute for 2 more minutes. Add mushrooms, Herbes de Provence and 2 Tbsp of butter and cook over medium heat until the mushrooms have softened and their liquid has evaporated, about 6-8 minutes. Sift flour over mixture in pan; stirring constantly. Cook over low heat, continuing to stir, for 2-3 minutes to cook off flour taste. Add the half and half, broth and sherry. Bring to simmer and cook over medium-low heat for about 5 minutes until the mixture has thickened enough to coat the back of a spoon. Add the pasta, turkey, peas and bacon to the pan. Stir in 2/3 cup of the Parmesan cheese. In a small bowl, combine the remaining 1/3 cup Parmesan and Panko bread crumbs; salt and pepper to taste. Sprinkle the mixture evenly over the turkey mixture and dot the top with the remaining 1 tablespoon butter, cut into small pieces. Bake 30 - 40 minutes until top is golden brown. This post is sponsored by Swanson however all commentary is my own. We make a version of this every black Friday, love it. Such a classic dish! We don’t make this with Thanksgiving leftovers every (or even most) years, but it’s definitely in our rotation. Yours looks great! Thanks. And Happy Thanksgiving. Happy Thanksgiving to you too John! 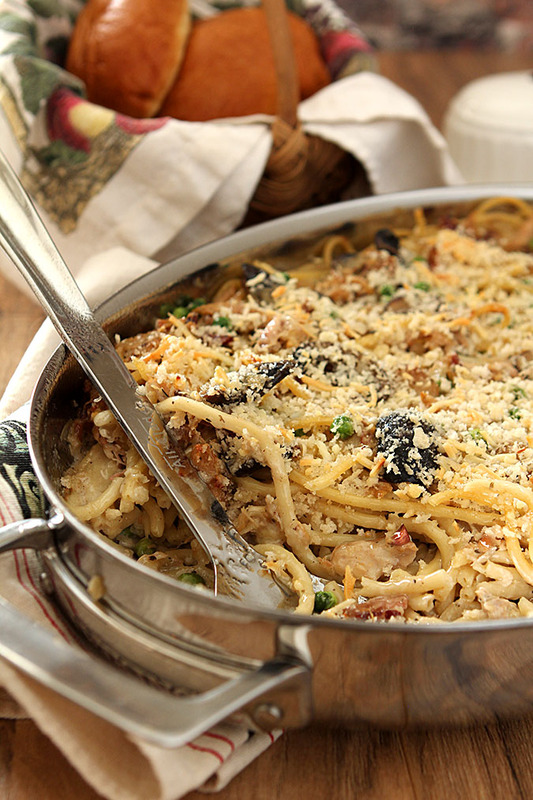 I haven’t had turkey tetrazzini in ages, but this is giving me a craving!! Thanks again for linking up to Taste and Tell Thursdays! I’m glad you loved it…I know we do! I looked at the recipe; the bacon is included in the ingredients to be added to the pasta and sauce in Step 7 and when I make it; I just use a large casserole dish that is safe for use on the stovetop so that I can do the stovetop steps and pop the same dish into the oven. I think it’s inherent in any recipe that we’ll all make some modifications to suit our style, tastes and yes…even our cooking utensils. I went to a friends for Thanksgiving last year, did not have leftovers so it’s been awhile for me and now I’m seriously craving this dish…thanks for the reminder! Not difficult Mark but some steps of course. But worth it; so very good. Hmm, even to having me think it might be time to defrost some of that turkey I have in the freezer! We love chicken and are always looking for new recipes, this is another one of yours that I’m going to make. We really enjoyed your chicken scaloppini and will definitely have it again. I’m with you…chicken is my mainstay; made something similar last night; chicken, mushrooms and rice from leftovers. Tonight? Having leftovers from my leftovers! This recipe looks like a good one. I lost my good turkey tetrazine recipe years ago. Will save this one! Thanks for the post.